The recorded history of Green Valley, located in Arizona’s Santa Cruz Valley, began in 1 A.D. The Hohokam, Pima and Tohono O’dham Indian tribes were the first to call this area home. The flags of Mexico, Spain, the Confederacy, the State of Arizona & the United State of America have all flown here. Spanish warriors, ranchers, missionaries, desperados & prospectors also lived here in earlier times. After the first white settlers moved in, the Hohokam Indians vanished. Many years passed & a new kind of settler, a “snowbird” arrived. They may have come to visit a friend, a tourist attraction or a real estate office & were drawn to the area and often became a resident. The more modern Green Valley history began in 1953 when a highway sign appeared in Interstate 19 that read “Live Now – Not Sometime – in an Established Community”. In 1964 a Chicago developer, Donald Maxon, and his brother/architect/construction manager, Norman, purchased 2,900 acres near Canoa Ranch for a residential development. Their vision soon became a reality and the Maxon brothers studied and photographed the late 18th century Spanish Colonial styles. The liked the arched colonnades, wrought iron screens and red roofs, features that are still found in many of the homes and buildings being constructed today. A “town that is too good to die…populated by people who have learned to live,” Green Valley has been a retirement community since its inception in the 1960s. The population of Green Valley was 500 in 1964. 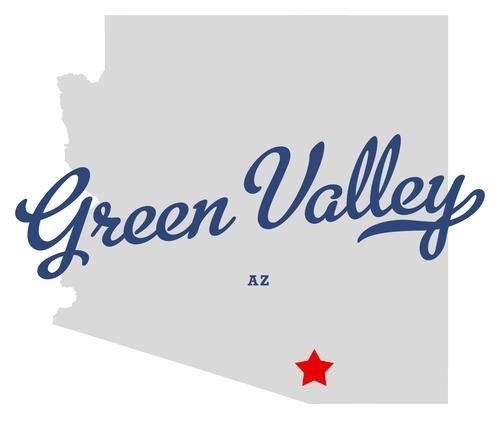 According to BestPlaces.net, Green Valley’s population has grown to 22,519 which is 70% growth since 2010. Source and additional interesting facts: BestPlaces.net/Green Valley, Arizona. With the sun shining over 300 days per year, Green Valley is part of the region dubbed the “Astronomy Capital of the World.” With its clear skies and minimal light pollution, Green Valley boasts star-studded skies most nights of the year.